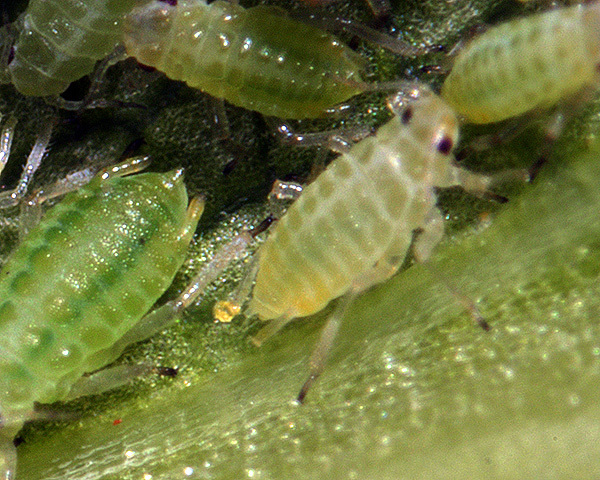 Cavariella are small to medium-sized green, straw-coloured or ochreous-reddish aphids. The body of apterae is rather elongate and a little flattened. Their antennal tubercles are rather low, about the same height as the median frontal tubercle. The antennae are rather short in the apterae but longer in alatae. The cuticle in apterae is strongly sclerotic, but not pigmented. The siphunculi are cylindrical or club-shaped with a small rim at the apex. They are very distinctly longer than the cauda, which is rather blunt. 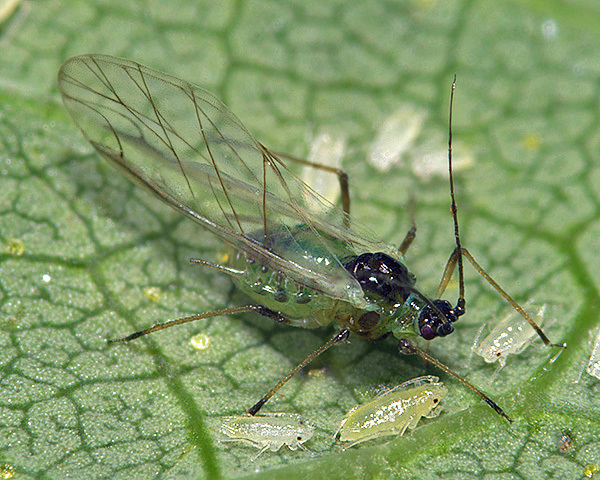 The supracaudal process on the precaudal tergite is usually diagnostic for this genus. Winged forms have a trapezoidal black patch on the dorsum in front of the siphunculi. There are 31 Cavariella species in the world, all of which host alternate from various willow (Salicaceae) species as their primary host to various umbellifers (Apiaceae) as their secondary host. 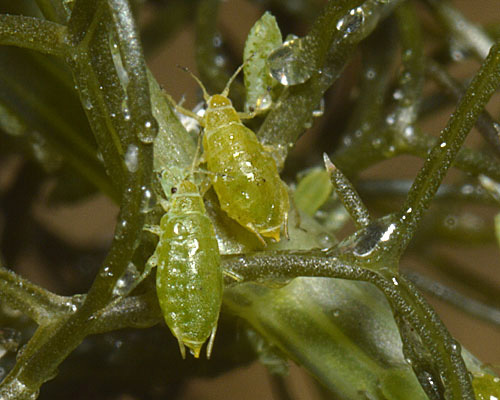 Most Cavariella species retain a sexual stage in the life cycle. They are not attended by ants. Cavariella species are difficult to differentiate from photos unless special attention is paid to getting good images of their siphunculi, supracaudal process and antennae. Cavariella aegopodii apterae are small and greenish or reddish. The tips of their antennae and apices of the legs are brownish. The antennae are about 0.4 times the body length, with the terminal process about 0.85-1.3 times the basal part of segment VI (cf. Cavariella archangelicae, Cavariella konoi, Cavariella pastinacae and Cavariella theobaldi which all have the terminal process more than 1.3 times the length of the basal part of segment VI). Cavariella aegopodii siphunculi are swollen and about twice as long as the cauda. The supracaudal process is 0.75-1.05 times the cauda, broadest at the base and oblong triangular to conical. 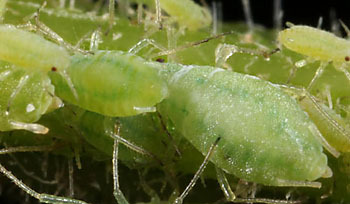 The body length of apterae is 1.5-2.8 mm. The alate of Cavariella aegopodi has a central black patch on the abdominal dorsum, and a dark cauda and siphunculi. 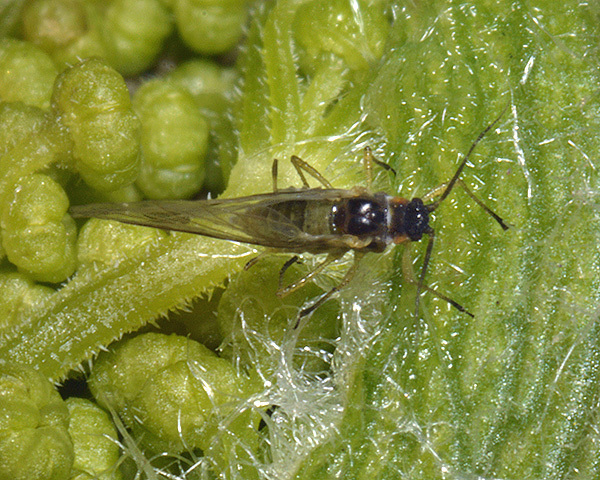 As with the aptera, it is best distinguished from the other common Cavariella species by its short terminal antennal process which is less than 1.5 times longer than the base of antennal segment VI. 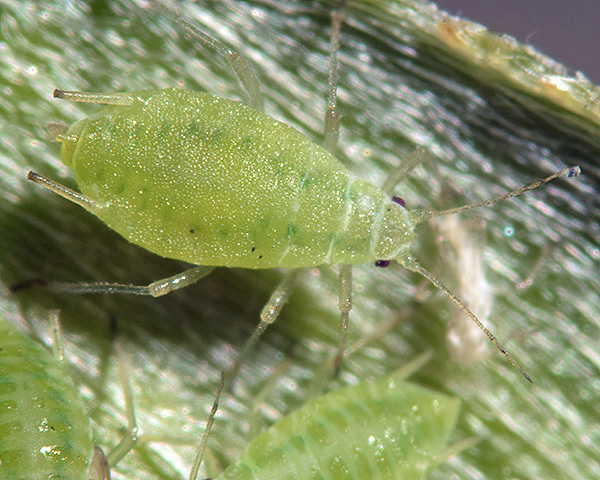 The willow-carrot aphid host alternates from willows (Salix spp) to umbellifers (Apiaceae). The preferred primary hosts are crack willow (Salix fragilis) and white willow Salix alba, although some Willow species seem only to be colonized in spring, by winged forms from populations which have overwintered parthenogenetically. Preferred secondary hosts are cultivated umbellifers such as carrots (Daucus carota) and fennel (Foeniculum vulgare) and several wild umbellifers. Cavariella aegopodii is widespread throughout temperate and warm temperate parts of the world. 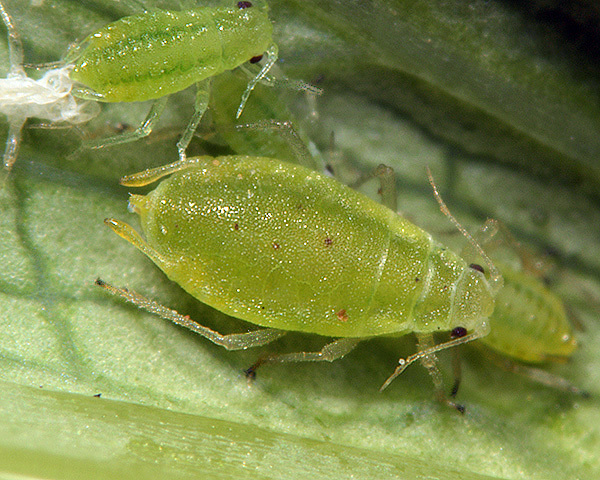 The adult apterae of Cavariella archangelicae are green or yellowish. Their antennae are 0.35-0.39 times the length of the body and the terminal process is1.5-2.0 times the base of the last antennal segment. Their siphunculi are more than twice as long as the cauda with the distal half somewhat swollen in a nearly symmetrical way (cf. Cavariella konoi which has the distal half swollen asymetrically, being more curved on the inner side than on the outer side). The siphuncular wax is colourless to slightly greenish (cf. Cavariella konoi which has the siphuncular wax distinctly yellow ). The supracaudal process has a broad basal part and is tongue-shaped about 0.7-1.0 times the length of the cauda. The body length of Cavariella archangelicae apterae is 1.5-2.6 mm. The alate Cavariella archangelicae has an uninterrupted dark cross band on tergite 6, thus continuing the dorsal black patch formed by the partially fused bands on tergites 3-5 (see second micrograph below, cf. Cavariella konoi which has the cross band on tergite 6 broken into two dark spots). 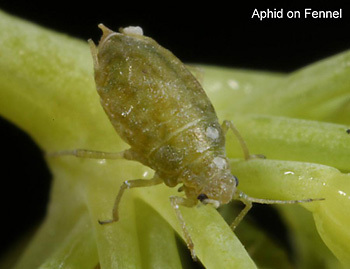 The willow - angelica aphid host alternates from willow (Salix spp.) to angelica (Angelica) and sometimes other umbellifers. Sexual forms occur in October. Cavariella archangelicae is found in Europe and western North America. 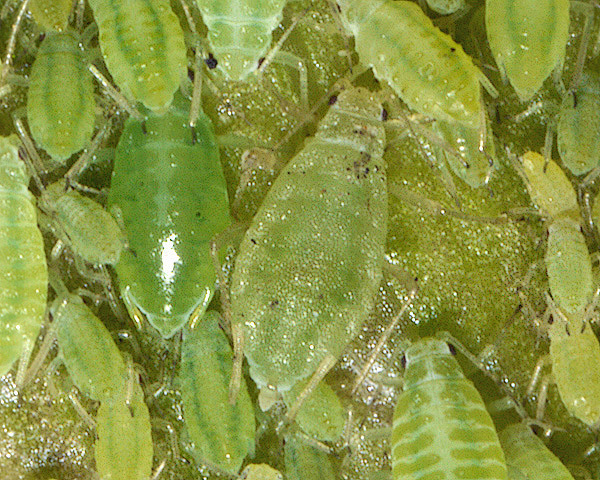 The adult apterae of Cavariella konoi are green or yellow-green, sometimes with rather faint darker green longitudinal stripe(s). The antennae, legs and siphunculi have brownish apices. The antennae are 0.31-0.50 times the length of the body, and the terminal process is 1.4-2.0 times the base of the last antennal segment (cf. Cavariella aegopodi which has the terminal process less than 1.3 times longer than the base of the last antennal segment). The siphuncular wax is distinctly yellow (cf. Cavariella archangelicae which has the siphuncular wax colourless to slightly greenish). Their siphunculi are 2.3-3.1 times the length of the cauda with the distal half swollen asymmetrically, being more curved on the inner side than on the outer side (cf. Cavariella archangelicae which has the distal half swollen in a nearly symmetrical way). The siphunculi are slightly shorter than (0.8-1.01 times) the head width across the eyes, and 5.0-7.3 times the maximum width of their swollen part. The supracaudal process has a broad basal part and is tongue-shaped about 0.5-0.8 times the length of the cauda. The body length of adult Cavariella konoi apterae is 1.6-2.9 mm. 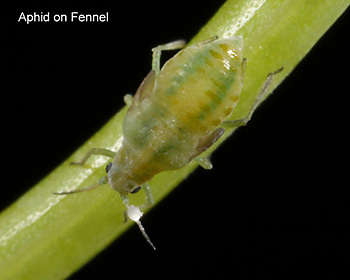 The spotted willow - angelica aphid host alternates from willow (Salix spp.) to angelica (Angelica). Sexual forms occur in October. The distribution of Cavariella konoi extends from Europe into Asia, North America and Mexico. 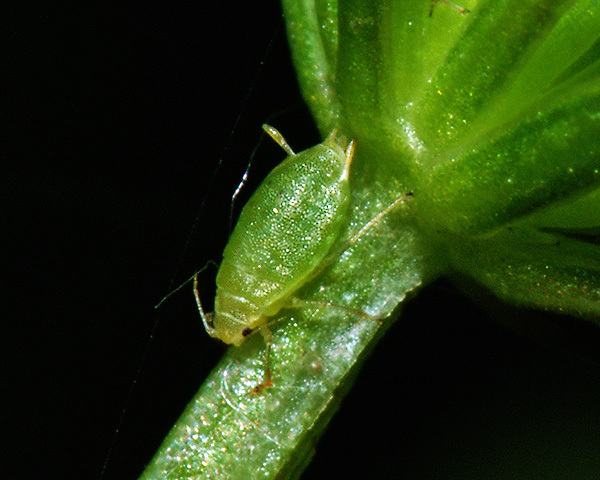 Adult apterae of Cavariella pastinacae are rather light shiny green with appendages pale except for the base of antennal segment VI and the tarsi which are dark. Their antennae are about 0.45 times the length of the body and the terminal process is 3.0-4.0 times the base of the last antennal segment (cf. Cavariella aegopodi and Cavariella archangelicae where the terminal process is less than 2 times longer than the base of the last antennal segment ). The siphunculi are 2.3-3.0 times as long as the cauda and are slightly swollen towards the tip (cf. Cavariella theobaldi which does not have swollen siphunculi. Warning: this can be difficult to assess in live specimens). The supracaudal process is broadly tongue-shaped, with a flat apex and is 0.5-0.8 times the caudal length. 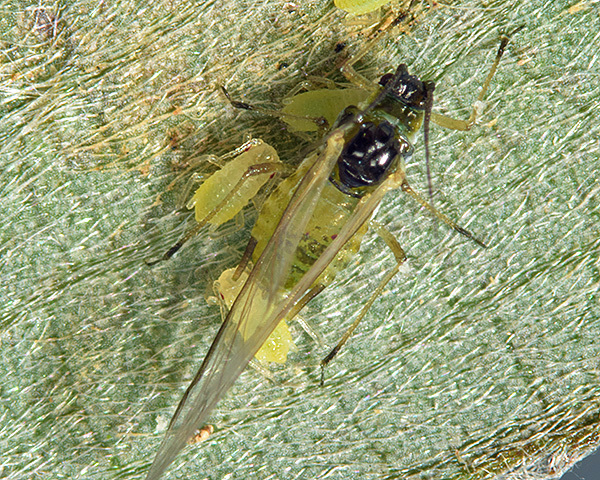 The body length of Cavariella pastinacae apterae is 1.8-2.9 mm. The Cavariella pastinacae alate has a dark abdominal patch formed by more or less fused cross bands on tergites III-VI. The antennae, cauda, supracaudal process and distal halves of siphunculi are dark. 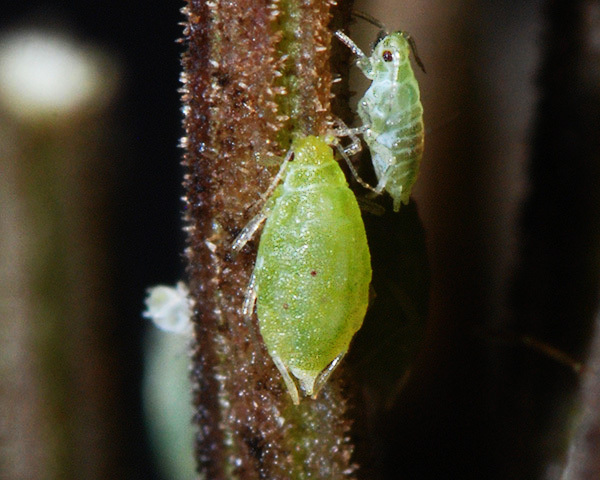 The willow - umbellifer aphid host alternates between willows (Salix spp.) and some umbellifers mainly hogweed (Heracleum), wild parsnip (Pastinaca) and Angelica. Cavariella pastinacae is common over most of Europe and in North America. Adult Cavariella theobaldi apterae are green with the tips of the antennae and apices of the legs dark. The antennae are 0.50 times the length of the body and the terminal process is 2.1-3.5 times the base of the last antennal segment. The siphunculi are more than twice as long as the cauda; they are not swollen, but are cylindrical or tapering from base to tip (cf. Cavariella aegopodi, Cavariella archangelicae, Cavariella pastinacae and Cavariella konoi all of which have their siphunculi swollen towards the tip). The supracaudal process is more or less four-sided and small, about 0.3-0.7 times the caudal length. The body length of Cavariella theobaldi apterae is 1.8-2.8 mm. The alate of Cavariella theobaldi has a dark abdominal patch formed by more or less fused cross bands on tergites III-VI. The antennae of the alate are dark and its siphunculi are brownish. The willow - parsnip aphid host alternates between willows (Salix species) and some umbellifers mainly wild parsnip (Pastinaca) and hogweed (Heracleum). Cavariella theobaldi is found over most of Europe into west Siberia, and parts of North America. Does this appear to look like Cavariella pastinacae to you? I first thought C. theoboldi, but the siphunculi appear to be slightly swollen, although on juveniles they look quite straight. Image copyright www.aphotofauna.com all rights reserved. Although my views may change on more reflection/examination, on Cavariella pastinacae versus C. theobaldi, it's very difficult in photos because both occur commonly on Heracleum, and the precise angle can change the appearance of the siphunculi. I'm going to do some slide preps soon to try to confirm a few provisional IDs. You may well get mixed species colonies on Heracleum. Starting to know exactly what you mean! LOL. Finding some quite tricky indeed, can probably get to genus level on some but futher than that it's like wading through treacle. It actually goes to show how good your site is as it's without a doubt the best reference point I can find for many. Yes and of course other species that will feed on most things. C. theobaldi hasn't been recorded in Cornwall but I guess it's here. Lots of records for Cavariella pastinacae but mostly from one person, which makes me wonder a bit! This fennel had either naturalised, or was planted, in [Bolitho Park] along the promenade at Wherry Town. 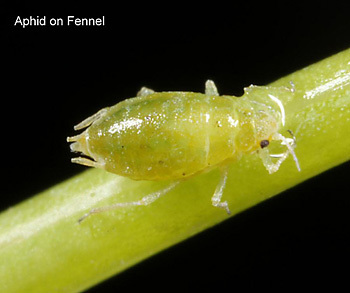 I'm fairly certain your fennel aphid is Cavariella aegopodii - the willow-carrot aphid. Antennae 0.4x body length, swollen siphunculi with the supracaudal process about as long as the cauda. We find it every year on fennel, often heavily pararasitized.